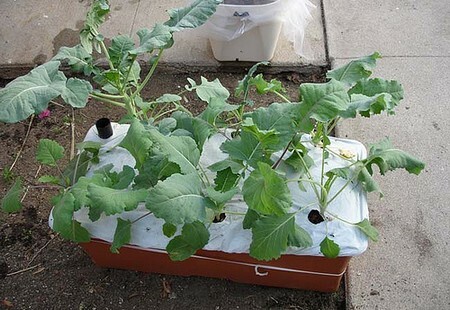 Planting one type of vegetable per container seems to work best. Mixed plantings of different vegetables, or vegetables and flowers in the same container, soon lose their visual impact once you start harvesting. Herbs are an exception; they work well as mixed plantings as only small amounts of leaf are taken. But the vigour of the plants needs to be matched – for example, you should keep invasive plants such as mint separate from slower-growing plants such as tarragon. Containers with a different type of plant in each can be combined to create eye-catching displays. 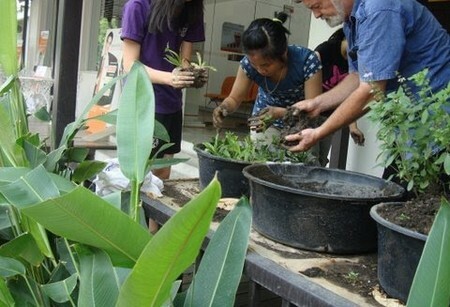 However, to keep the interest going, it is well worth having some pots of plants in reserve to replace harvested crops. Late-flowering plants such as fuchsias, impatiens and marguerites all work well. You can use almost any container, providing it is a reasonable size and has drainage holes in the bottom. Where cost is a consideration, use plastic or recycled containers as they are the cheapest. Terracotta looks attractive and is timeless but larger sizes are expensive. The sides of terracotta pots are porous so compost tends to dry out. This is not a problem for most herbs, but it can limit cropping of vegetables. Line the inside of the pot with polythene to keep the compost moist. The bigger the container the better, unless you are prepared to water the plants twice a day in summer. As a guide, use at least a 2-litre (15-cm) pot for single smaller vegetables – a lettuce, say. Better still, use 10-litre containers (about the size of a domestic bucket) for a single larger vegetable or a group of three or five lettuces. Thirsty crops such as beans, cucumbers and tomatoes will benefit from a 15-litre container (the size of a builder’s bucket). Avoid shallow containers, i.e. under 15cm deep, as these do not give the roots enough depth and, as a result, the compost tends either to become waterlogged, or dries out very quickly. Multipurpose compost is convenient, and all vegetables will crop well when grown in it, but large quantities can be expensive. Consider using the compost out of growing bags, which should be cheaper; a typical growing bag should contain at least 30 litres of compost. Tip the contents of the growing bag into deeper containers to make watering easier. Another way to eke out the compost is to add up to half by volume of garden topsoil. If you do this, be prepared for some weeds; otherwise top up the pot with a layer of pure compost to act as a mulch to suppress weed seeds. Cover the base of the container with a layer of crocks (broken terracotta pots), stones and/or gravel – broken-up expanded polystyrene packaging material is a modern substitute. Any additions to the compost, such as topsoil or grit (a couple of handfuls are sometimes added in to improve drainage for Mediterranean-type herbs, such as rosemary and thyme), should be mixed in well before filling the pots. Add the compost, then plant the young plants, firming down gently as you go. Alternatively sow seed beetroot, carrot and salad crops into the container as you would if you were sowing directly into the soil. Cover with l cm of compost. Leave a 2-3cm gap between the top of the compost and the rim of the pot to make watering easier. Early in the summer, try not to overwater young plants, otherwise the compost will get waterlogged. Once the plants are growing and the weather is warmer, you need to water frequently so the compost never completely dries out. Some plants, lettuces in particular, start to suffer if left in full sun during the hottest part of the summer. It will be easier to keep them watered if they are in a shaded or semi-shaded part of the patio. The compost should have sufficient nutrients for even the greediest of crops for at least four weeks after planting. After that you will need to supply extra plant food. Vigorous leafy crops, such as cabbages or lettuces, will need a balanced liquid fertiliser, i.e. one with equal proportions of nitrogen, phosphate and potash. For fruiting crops such as cucumbers, peppers and tomatoes, use a liquid tomato feed; this will provide more potash. Follow the application rates for each product. Watch out for pests and diseases, and follow the advice given for each vegetable if necessary. Slugs and snails can be prevented by fixing a barrier of copper tape around the container. If you use hanging baskets, crops will not be large but they can be hung at a convenient height for picking and should not be bothered by slugs. Herbs such as mint, parsley, chives, small sage plants and basil work well, as do edible flowers such as nasturtium and pot marigolds. If you can cope with the extra watering, consider growing the dwarf tomato ‘Tumbler’. Dwarf peas and dwarf French beans will tumble from a basket, too.